Good morning! Or “Lichile!” in Shangana, one of the local languages spoken in Mozambique. 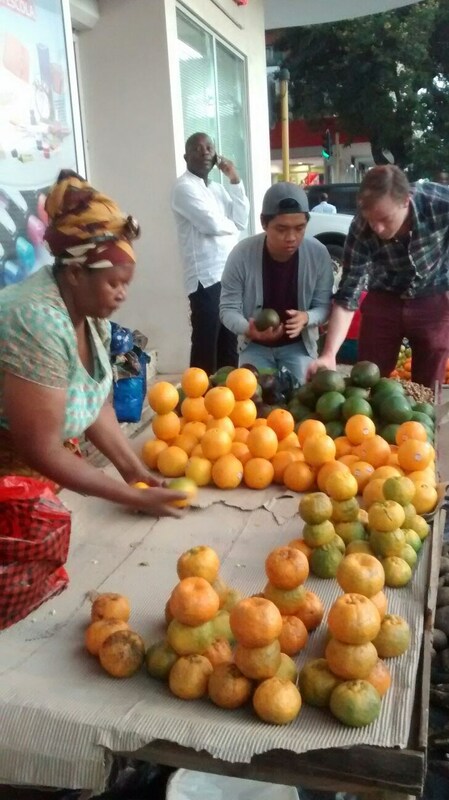 It has been three weeks in Maputo and, as time goes by, the taste of the unknown has become somehow familiar and enjoyable in our neighborhood. Simone, the Italian, early mornings, stops by the coffee place and updates us about the cultural activities in Maputo; José, the owner of the Café, Mozambican and son of Portuguese, talks about the most varied subjects, from pastry recipes to the Portuguese colonization. Fernando, who studies medicine and lives in the same building, is always around the residence, almost ubiquitously, unless at the end of the afternoon, when he goes to the mosque, because it is Ramadan. All the street vendors, who sell anything that you can imagine (expect for a laptop charger I really needed) are already part of our daily landscape. Greeting and recognizing people in public places are starting to be regular. Yes, we realize Maputo city is small and welcoming. On Tuesday morning, 21th June, Celma came to meet us at our residence. She just came back from Delft, where she spent some months at TU Delft working on her research proposal. Now she is back in Mozambique to continue her investigation. We met in the study room of our residence to discuss about the possibility of doing a Material Flow Analysis (MFA), focusing on the agricultural process. She stated that she would like to quantify water and nutrients flows in Maputo´s agricultural areas. In order to analyze the feasibility to recover and/or allocate nutrients, such as nitrogen and phosphorus, that can be reused as fertilizers as well as to minimize the excess of nutrients discharged into water bodies. Celma and I discussed about one of the MFA software called SIMBOX – the tool I am using for my research project. I explained the steps to take to apply an MFA in SIMBOX, its strengths and weakness, and how important it is to consider uncertainty analysis, since in developing countries lack of data is a constraint. Celma, then proposed a visit the agricultural areas of Maputo, “Zonas Verdes de Maputo” in Portuguese. Additionally we will visit the Infulene wastewater treatment plant (WWTP), which is located also in the same area, and is sometimes used as source for irrigation water. I am very happy to have the opportunity to go to the agricultural fields, since I really need to gather relevant data there and Jay-el and Jesper are looking forward to knowing and experiencing the outlying areas of Maputo. Jay-el specifically wants to know about the costs involved in the processes within WWTP as well as the costs incurred, if there is, for the people who currently practices water effluent re-use in agriculture. While Jesper is interested in the responsibilities of several municipal and regional offices that are involved at the treatment plant. Are discharges from trucks and the sewer registered, and how is the effluent water from the WWTP distributed or disposed and who is responsible for such processes? Interesting news should be updated about this field research next week. On 22th June we went in the morning to Nelson’s office, so as to use the internet to have a good Skype meeting with André. 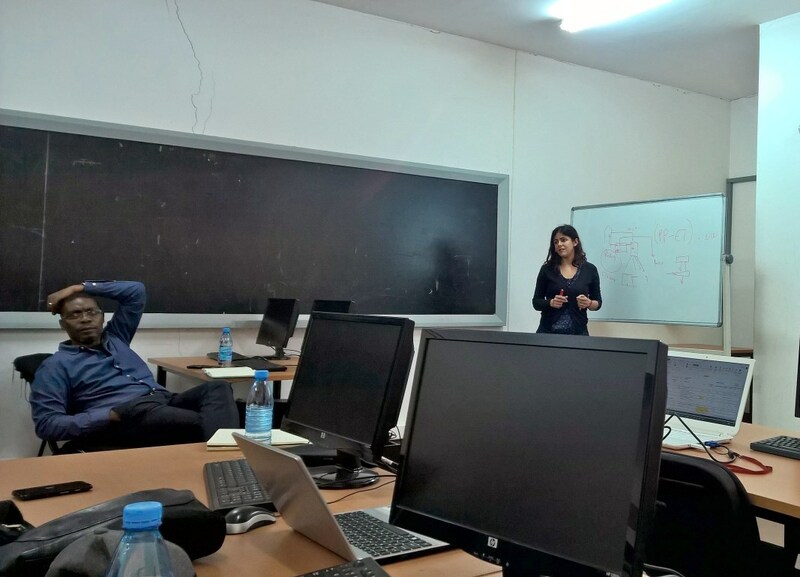 After the meeting, we agreed with Nelson that we would each give a presentation about our research topic the next day at the Eduardo Mondlane University’s Faculty of Engineering. The next day, when we arrived at the university, Nelson had organized a very nice room with a projector for us. I started presenting my research topic: “Assessing water and nutrients flows in the city of Maputo, Mozambique”. Jay was the second to discuss about: “A life cycle analysis of the technical and social costs for the provision of sanitation services in Maputo, Mozambique” and, Jesper finalized with “Analysis of the challenges and solutions in the water and sanitation sectors in Greater Maputo, Mozambique”. Nelson is a Civil Engineering Professor and knows a lot about the water and sanitation system in Maputo. Besides his knowledge and feedback, he has many contacts to present us, from whom we could gather more information. It was a long but very productive discussion. Presenting our work to Nelson. In the evening we visited Associação dos Músicos Moçambicanos where a film about Maputo was premiered, followed by a swinging jam session of local musicians. Here we met Jonas Massingue, the Mozambican manager of a pilot project with Mobile Water Management, a Dutch start-up with a smart phone based app used for the registration of water consumption in households. Their project is in cooperation with ViaWater and Collins Lda, whom we will be sure to contact in coming weeks. Jam session every Thursday evening. 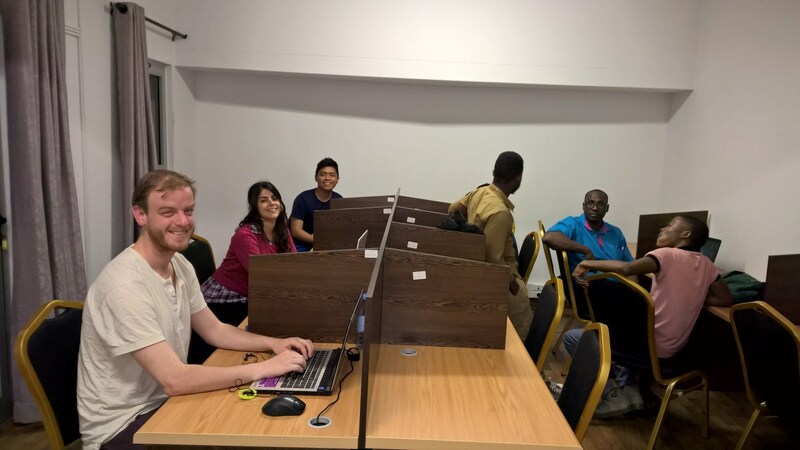 Besides the meetings, going out and eating in the canteen, we spend a lot of time in the study room, since it is the only place in the building with access to the internet. It is our “office” here but also a very good place to get to know people, to observe and make experimental questionnaires. Fernando told us how the sanitation system works in his city, in the North of Mozambique, along the coast. He said open defecation is still culturally accepted in some coastal areas and it remains a big challenge to revert this situation since underground storage is difficult to construct in the local sand. Another student of medicine, who was doing a survey about malaria, told us that poor sanitation system in Maputo is one of the major causes of diarrhea and cholera. Moreover, he stated that it is necessary to raise awareness to construct public toilets in the city: He explained – “Sometimes we go to some bars and there are no toilets and we feel obliged to go in the streets, for example. It also happens that families rent places without toilet facilities, throwing out their excreta on the streets or into the drains”. The study room – where we spend most of our time. There is a diversity of characters in the study room. Hélder, a recently graduated Philosopher, enters and leaves the room singing and listening to rap music; while another boy, who we still could not figure out his name and is already on holidays, goes there to watch and download movies, particularly the new episodes of Games of Thrones (Jay-el was also very interested about it). Baiano, a PhD student in Geography from Brazil, spends a long time arranging his maps and we became very interested on those maps for our Master theses. 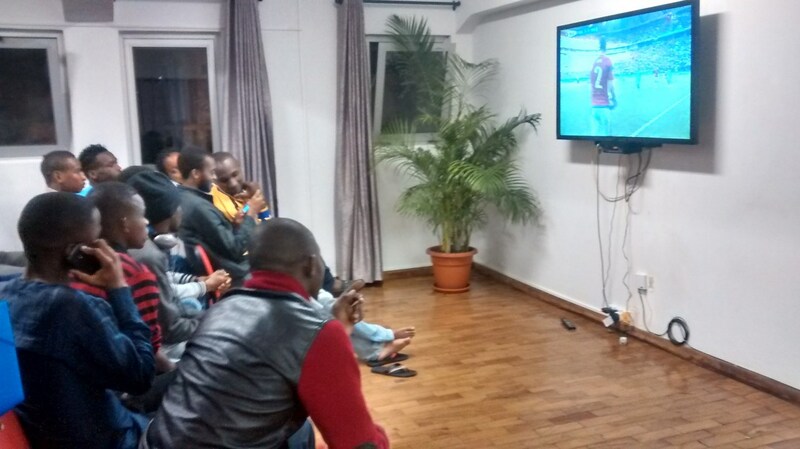 The study room turns into silence during the games for the Euro football cup 2016, especially when Portugal is playing. 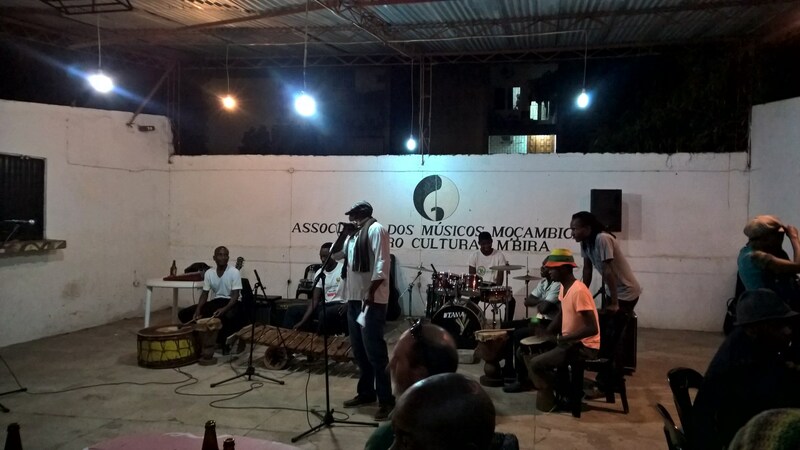 And to finalize the week, Saturday, we celebrated the independence of Mozambique, which was on 25th June, 1975, in Associação dos Músicos Moçambicanos, with live and traditional music enjoying local beers. Sunday morning after an early jog, as always, we had a little breakfast in our “private” balcony. This time with pineapple and passion fruit, or “ananás” and “maracujá, in Portuguese. In the afternoon Jesper was invited and urged to join some of the guys living in our residence to play in the inter-residential student futsal competition. Every Sunday teams from all the residences of the UEM meet up at the sportshall on the campus, to play with teams of 5 against 5 inside a heated atmosphere. ‘Our’ team is named Fifinhos which means rich kids, referring to the excellent facilities at the SELF residence. The match ended in a 4-4 draw, resulting in Fifinhos first point in this year’s competition. Well done Jesper! All eyes on the heated match. Our dose of fruit from the street vendors. This entry was posted in general, Iana, information, Students and tagged Infulene, irrigation, maputo, mozambique, sanitation, sewage network, water, water recycling, water reuse, WWTP by André. Bookmark the permalink.